As previously mentioned, we will be doing a series of articles on our experiences with four house sits we acquired, back-to-back, all in Ontario, Canada. Our second house sit took us to Markham Ontario. Markham is a city in the Regional Municipality of York within the Greater Toronto area of Southern Ontario. It is also Canada’s 16th largest city and changed its status in 2012 from town to city. Population in 2014 was 329,204. There is old Markham and new Markham with a cultural mix, parks and heritage sites. The part of Markham where our house sit was located made for a pleasant stay. It was quiet, the homes were well maintained and in many cases, beautifully landscaped. 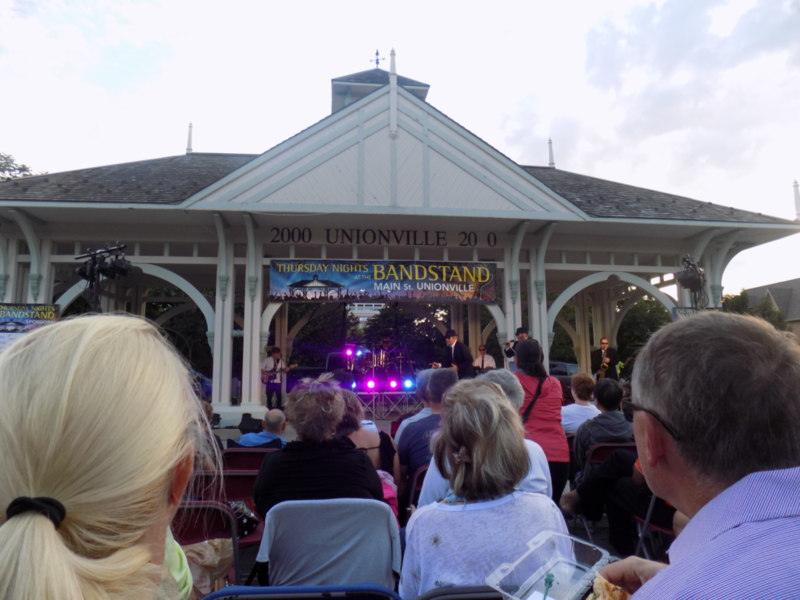 We took the opportunity to visit the Unionville Band Stand and were treated to a free Blues Brothers tribute. The bandstand was packed with enthusiastic listeners, all there for a good time. We also took the time to check out the Markham Heritage Estates – Canada’s first heritage subdivision – a uniquely designed 42 lot subdivision owned by the City of Markham. It was initiated to offer an incentive for the relocation of heritage buildings that might otherwise be slated for demolition. Lots are sold below market value to entice owners to relocate and restore their heritage homes. Thus, in turn, heritage properties can be saved and restored instead of being destroyed. If you have an opportunity, take a drive through the estates and see for yourself! It’s located at Heritage Corners Lane at 16th Avenue, Markham. Here you will see examples of late Victorian frame, picturesque style, 19th century pioneer, Regency influenced Georgian architecture, Edwardian style, Gothic Revival, Regional style, Second Empire style and Ontario Cottage style to name a few. We arrived promptly for our meeting with our host in Markham. We really enjoyed meeting and getting to know a little about him and the house sit. As with our hosts in Seaforth, Jeff continued to set the bar high. 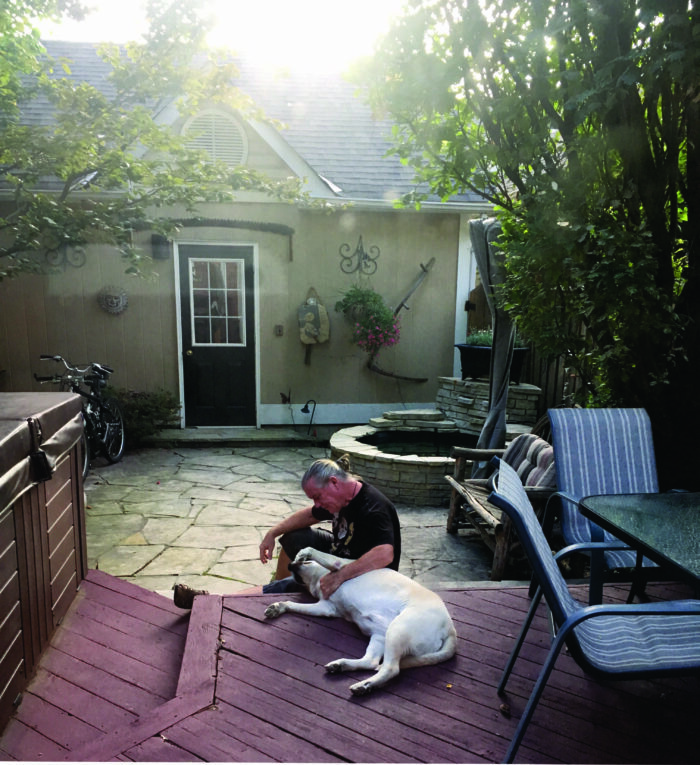 He turned out to be quite a conversationalist with a good grasp of the history of the area he lives in and delighted in taking us for a drive around the area, including the Markham Heritage Estates. 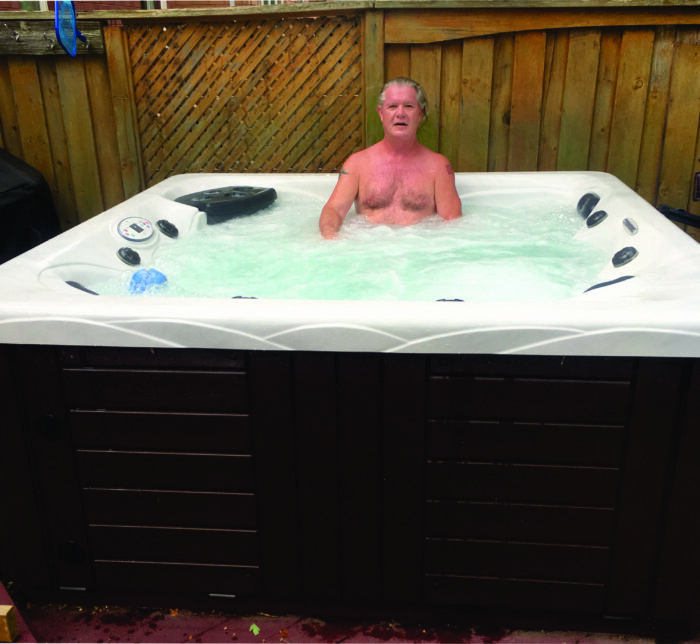 He immediately made us feel quite at home; we were comfortable and were provided with everything we needed to make our week-long stay enjoyable, including the use of a hot tub in his small but quaint backyard. The house was clean, large, and we had pretty much the use of all of it. Even though he has lots of unique items in his home, it was a place that was well-lived in and reflected his love of beautiful things. He also made sure he was very accessible should we need to contact him for anything and looked forward to our daily updates and photos of Zoe. 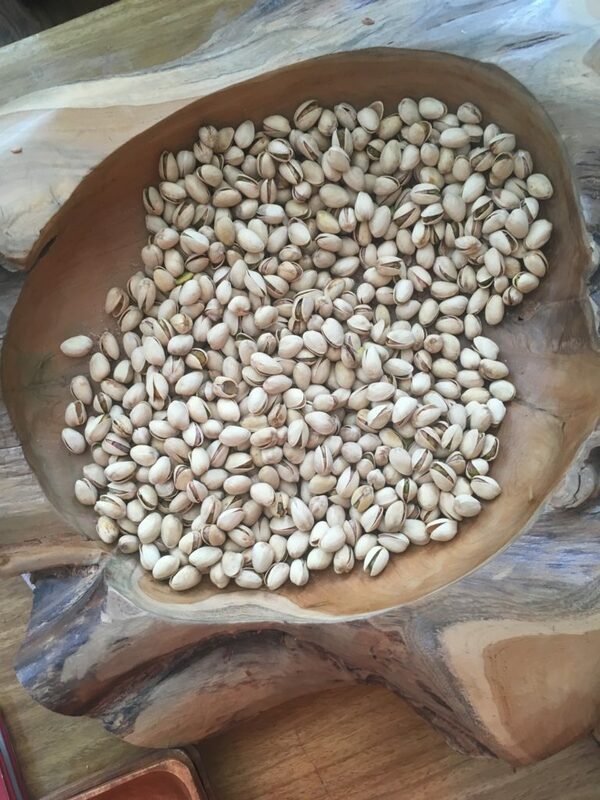 Jeff does a lot of travelling and we enjoyed the little things that made him interesting to us such as this HUGE wooden bowl of pistachios. Zoe is a 9-year-old Golden Lab/Malamute cross, with one blue eye and one brown eye. You can’t help but fall in love with Zoe. She is sweet-tempered, loves to be petted and have her belly rubbed. Like Pipi in Seaforth, she had her daily routine: meals, medication and regular walks. She was not a picky eater and looked forward to her meals, and especially her treats. She loved her walks. I let her take the lead one noon hour and I think we walked for close to 40 minutes! I was getting tired but she was still rearing to go. Zoe liked nothing better than to stop in the middle of her walk, roll over, scratch her back in the grass and look at us as if to say “you should try this! It’s fun! !” But she was quite happy to have her belly rubbed too! Zoe’s sleeping pattern was to find a place that was comfortable for her but she always came into our room in the morning, licked our hands or face, or whatever was reachable for her, to let us know it was time to start the day. As with Pipi, Zoe was a very well-behaved pet that made looking after her a real joy. It doesn’t matter if you are looking after a little Shih Tzu or large lab, most dogs love attention and being pampered. They make you stop and take a break from your busy day. We learned that Jeff liked to be kept in the loop so we gave daily updates so that he would have peace of mind while he was away. The Welcome Guide was detailed with all the necessary information, including emergency numbers and veterinarian names and numbers should we need them. Never assume that you know exactly what the owners are expecting from you. Take the time (even though it may be just an hour or two), to really listen to them and to reassure them they are leaving everything in good hands. Our second house sit was a success! Sitting for Jeff was fun and he was so appreciative of how we kept his house clean. My husband even did a few minor repair jobs that Jeff kept putting off. We would not hesitate to sit for him and Zoe again, should the need arise and we are available. Before we left, he invited us for coffee and breakfast before we started on the next leg of our journey. So far, so good. We are so glad that we checked out TrustedHousesitters. It is giving us an opportunity to meet new people, in new areas. If you are interested in checking out this way of life, click TrustedHousesitters for more information. It could change your life; at the very least it will give you an opportunity to make new friends and see new places. We hope you enjoyed hearing about our second house sit. Feel free to share any comments below and check back soon for our next sit in Ottawa.